We are coming to the end of the season. Not long now until the weigh-offs. 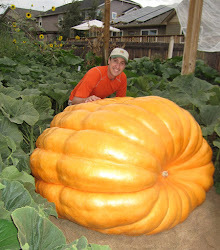 For some, they are looking at personal best pumpkins and possible state record giant pumpkins. Even if you don't have a pumpkin this year quite as big as you would have liked it to be, there is still time to add a lot of weight to your pumpkin in September to finish it off. What if you could add an additional 13% or more to your pumpkin by just doing three things?! Wouldn't you do it? It could make the difference in moving up one or two places in the standings. And the solution is simple if you know the right fertilizers and nutrients for late season growth. The most interesting part of this chart is potassium in the fruit. Potassium is found in large quantities in pumpkins, so the more you can get to the fruit the better. In the same study yields were also found to be higher in cantaloupe receiving potassium sulfate. In comparison to the control group, yields were 13% higher in the group receiving soil and foliar potassium sulfate over the control group. "If potassium is deficient or not supplied in adequate amounts, growth is stunted and yields are reduced . Potassium is associated with movement of water, nutrients and carbohydrates in plants. The relation between potassium and fruity vegetables such as pumpkin is well established long time ago. There is increasing evidence from the literature that optimizing the potassium nutritional status of plants can reduce the detrimental build up of reactive oxygen species (ROS) which result from various environmental stress factors. In addition, it is widely acceptable that in general, high potassium status in crops decreases the incidence of diseases and pests." In my own soil reports from the spring to the spring of the next year, with no potassium being added to the soil, I've seen my potassium levels drop 500ppm. Even if you have adequate levels of potassium in your soil it may not all be available to the plant, so supplemental potassium could help keep the plant from bonking late in the season. Watch this video to learn more. Second, foliar and soil applications of nitrogen at this point of the season might also be a good idea for the same reasons. Although nitrogen tends to be more available to the plants that other nutrients, nitrogen levels can drop due to leaching from the heavy watering most growers do during the season as well as the plant using it up. One grower, who is very knowledgeable and has grown some monsters once told me that some late season splits are sometimes due to inadequate nitrogen. So giving the plant a little extra nitrogen now could pay off big time on the scale. Lastly, giving your soil some RAW Cane Molasses now could also give you a lot on the scale later. At this point of the season, when the demands on the plant are great and it is getting tired the plant can be more stingy giving sugars back to the soil microbes that are giving the plant nutrients. Because of this the soil biology can start to slow down. Applying some RAW Cane Molasses to soil can give those microbes an added boost so they will continue to give nutrients to the plant that will power the pumpkin's growth.